ptoing and I recently wrote a few words about 8Bits Fanatics II and their PC release Kolkhoz 2828, and after playing through the rest of their back catalogue I decided that this little NES tribute was worth plugging on RGCD as I haven't seen anything about it on the usual sites (indiegames.com/tigsource.com). Many of you will be unfamiliar with the original NES release on which this is based, so I'll explain how the game works. As you'd expect in a standard shmup, you move your racer around a horizontal scrolling level avoiding obstacles and blowing stuff up. Your energy (fuel) drops at a constant rate - moreso when you are hit or crash - and you'll need to keep it topped up by collecting energy pods (radiation symbols), so be careful not to shoot them. There are also little people waving at you that need to be rescued (for points) so don't shoot them either. 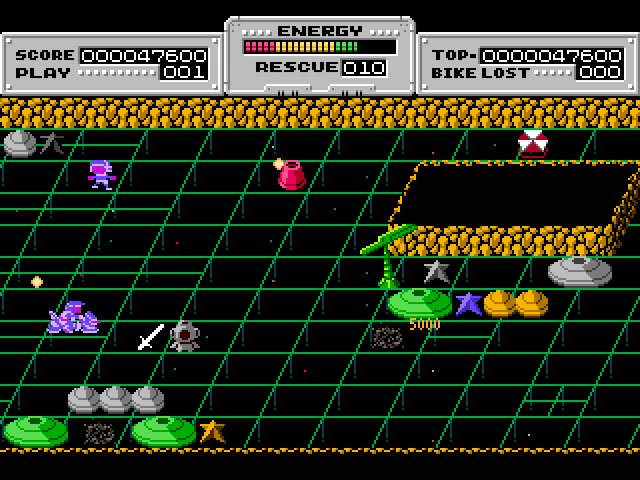 Aside from that, everything else is a valid target, with certain pieces of scenery rewarding you with pickups and bonuses (flashing stars upgrade your weapons, but I have no idea what the other items do). However, the real fun comes from ramming and shooting the other bikes. Fire a few rounds of plasma at an enemy and they'll fall off their hoverbike and lie prone on the floor, at which point you can blast them repeatedly for extra bonus points - with each shot propelling them forward along the battlefield, making it possible to stack up multiple victims at the same time. It sounds a bit silly, but racing along the track whilst emptying magazine after magazine into a load of happless opponents and racking up points is really satisfying in a way that Road Rash and other violent racers are not. Add to the mix the cute retro graphics and sound (especially your own ridiculous death animation), there is very little not to like. The first stage is definitely the better of the two, with the second level dropping the speed of the former in exchange for a more standard bullet-laced shmup fare. 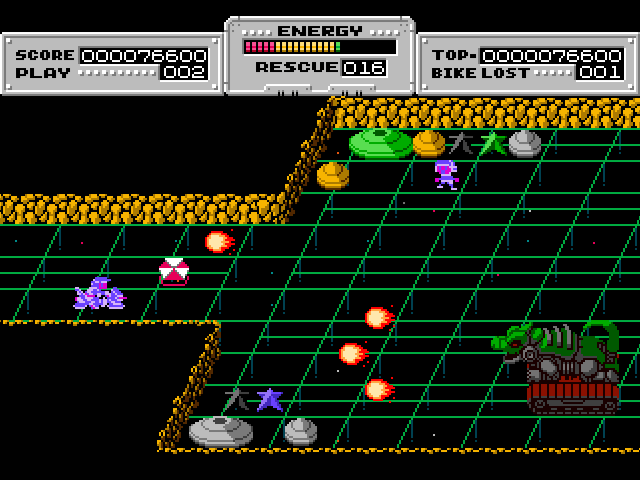 It's certainly challenging to battle through the advancing dragon tanks and rapid fire gun turrets, but it's no way near as fun as mowing down other bikers. And then, just when you're getting into the swing of things the game ends. 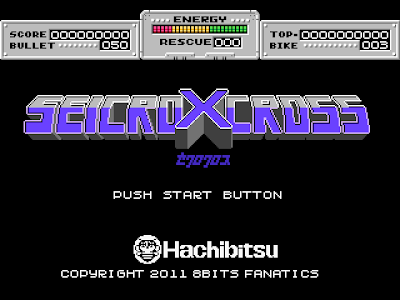 A funny little quirk of Seicro X Cross is that after each stage the people you rescue are offloaded and points are awarded, but at the beginning of the second second level you can actually recollect them all again, which may be a design flaw but certainly made me snigger. 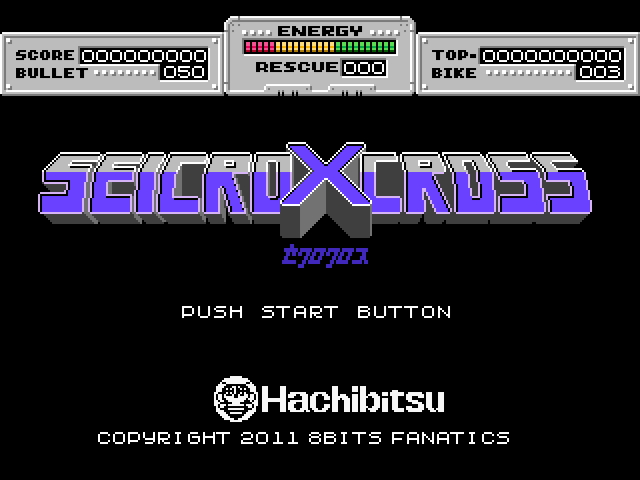 Playable via joypad or keys, with the F4 key toggling full screen and windowed modes, Seicro X Cross is a fantastic little doujin game. Downloading it from the official site is a bit of a pain, so I've mirrored it on the RGCD server. That looks amazing, definitely going to download it. 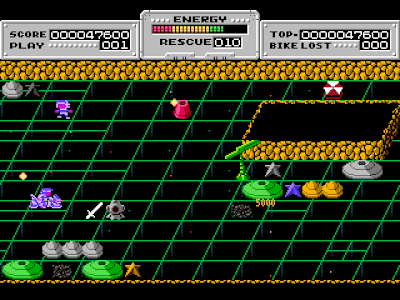 I still believe the NES/SNES days were the most enjoyable games I've ever played, and whenever I see a tribute to those days, the games usually join them in great quality. Never played the original, but I'm sure I'll enjoy this regardless.